Outlander star Grant O'Rourke has been named best actor at a theatre awards ceremony for his performance on the Scottish stage. O'Rourke won the Best Male Performance Award for his role in The Venetian Twins at the Royal Lyceum Theatre in Edinburgh. The Royal Lyceum dominated the 2015 Critics' Awards for Theatre in Scotland (CATS), winning six of the ten awards. Its production Caucasian Chalk Circle took four awards. The Brecht play won Best Production, Best Female Performance (Amy Manson), Best Ensemble and Best Director (Mark Thomson). The judges said: "In a remarkable season at the Lyceum, Mark Thomson's production of Brecht's great play stood out for its scale, ambition and unabashed theatricality." Another Royal Lyceum production, Bondagers, picked up the Best Design Award. O'Rourke plays Rupert MacKenzie in the US-produced TV show Outlander, which is a historical time-travel series set in 18th century Scotland. 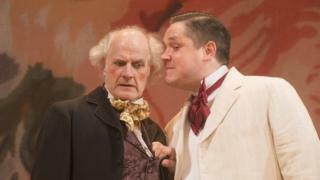 The Edinburgh-born actor won his award for playing twins Zanetto and Tonino in the Royal Lyceum production. CATS co-convener Mark Fisher said: "This has been another wonderful year for theatre in Scotland, and it speaks volumes about the quality of the work being produced at the Royal Lyceum that no fewer than three of its productions have triumphed against such strong competition." In 2015, 196 productions were eligible for the CATS including 78 new plays.